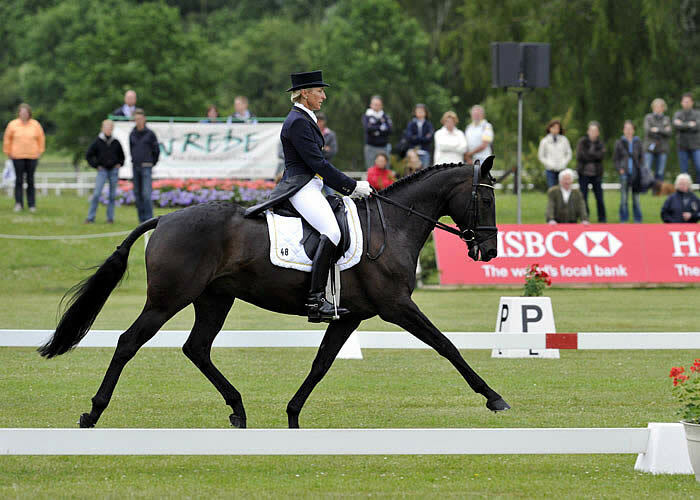 18 June 2010 – Ingrid Klimke (GER) proved that she is back at the top of her game when producing a typically convincing display to take the Dressage lead at Luhmühlen, presented by E.ON Avacon, which is the third leg of the HSBC FEI Classics. The Olympic and World team gold medallist, who gave birth to her second daughter, Philippa, on March 8, is, surprisingly, making her debut at her home nation’s CCI4*, and is out to convince the German selectors that she should be a member of the team defending their title at the FEI Alltech World Equestrian Games in September. The breezy weather may have come as a shock to horses after the gloriously sunny few days previously. Christian Landolt (SUI), a member of the Ground Jury with Judy Bradwell (GBR) and David Lee (IRL), remarked that it seemed to be making some horses a little tense. American visitor Allison Springer (USA), also making her Luhmühlen debut, would probably agree. She is lying second, having produced her usual attractive test on her regular partner Arthur. She knows the Irish-bred gelding well, having produced him from a youngster, but admits that the beautiful chestnut does not get any easier to ride. The experienced partnership of Susanna Bordone (ITA) and the Australian-bred mare Carrera are in third, ahead of the 2009 HSBC FEI Classics champion Oliver Townend (GBR), who had a highly satisfactory day – he is in fourth and sixth on his two greys, Carousel Quest and Ashdale Cruise Master. The current joint-leader of the HSBC FEI Classics, Paul Tapner (AUS), is lying ninth on the bold Cross-Country horse Kilfinnie ll and is well poised to extend his advantage in the series. “Winning Badminton has certainly changed my perspective,” he said. Tapner, who was seventh at Luhmühlen last year on Inonothing, his potential FEI Alltech World Equestrian Games horse, said he felt the Cross-Country had been softened from 2009 but would still be influential. Mark Phillips’ (GBR) track is certainly beautifully presented: the going is even, with good grass cover, and builder David Evans (GBR) has his trademark carved animals – vultures, dragonflies, ducks, owls and squirrels – adorning many of the obstacles. Wiegersma will be first of the field of 43 to go out on the Cross-Country, riding Granntevka Prince, 14th, at 10.40 CET. FEI TV: Luhmühlen will be shown on FEI TV; visit www.feitv.org.